Drywall texture is pretty neat stuff. It is a great way to hide imperfections, adds visual interest, and disguises dirt better than mirror smooth finishes do. 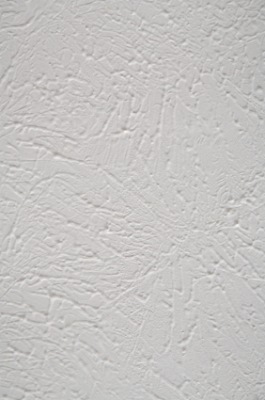 You can apply drywall brush texture yourself with just a handful of tools. Slap brush texture is also known as stomp brush texture, crows feet texture, tiger skin texture, palm texture, and panda paws texture. The slap brush technique is easy and popular. It is especially forgiving on poorly finished drywall. It’s always a good idea to prime the wall, both before and after texturing. Before texturing, it seals the drywall and mud and creates a slightly rough surface for the texture to adhere to. It also promotes more even drying, which results in uniform texture. Tint the primer first; that way, you won’t miss a spot with the texture, baby blue or sky blue works good. Scoop half the drywall compound in a five gallon bucket, the other half into a second, clean bucket. Add water, a cup at a time, and mix with a drill and ribbon mixer attachment. When ready, it will have the consistency of a thick milkshake or pancake batter. There are three ways to apply the drywall compound and create the slap brush effect. The most common is to roll on the drywall compound, then use the brush for stippling. Pour a small amount of the thinned compound into a paint pan. Working in 6 foot sections, use the paint roller to apply a 1/8″ thick layer of the compound to the wall. Use the extension pole for hard-to-reach places. While the compound is still wet, use the brush to create a stippled effect. Hold the brush perpendicular to the wall and press it straight into the wet compound, then withdraw it. You can also apply the compound directly to the wall with the texture brush. 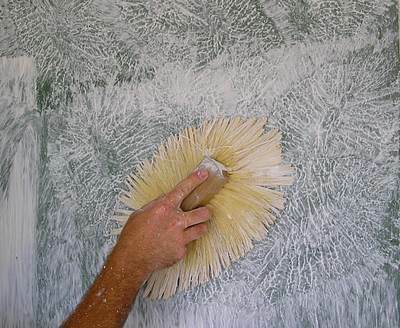 Again, hold the brush perpendicular to the wall or ceiling and using dabbing motions to apply the texture. 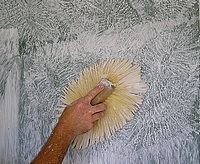 The third method involves spraying on the compound with a texture hopper, then using the brush to stamp on the texture. Renting both the hopper and the air compressor will cost about $40-$60 per day, depending on where you live. Using a texture hopper will allow you to apply the compound faster, but you’ll still want to work in fairly small sections so the mud doesn’t dry out before you have a chance to texture it. If you choose this method, be sure to wear safety goggles. For more on using a texture hopper, read this article on applying orange peel texture. If you recently patched a damaged section of wall, there’s no reason to redo the entire room. Prime the patch first. Examine the existing texture carefully; you’ll want to match it as closely as possible. 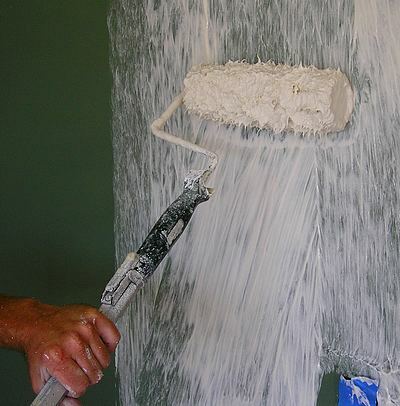 Roll or spray the drywall mud onto the primed area, then apply texture with the brush. After the texture dries, apply another coat of primer. Drywall mud is very absorbent, and paint will just soak in if you don’t prime first. For the most uniform result, only one person should do the texturing; it is virtually impossible for two or more people working together to create the exact same effect. If you must have a helper, one of you should roll or spray on the compound, and the other should use the stippling brush. Practice on a scrap of wood, drywall, or even cardboard until you have your technique down. Apply drywall brush texture using a thinner compound and a light touch for a fine, delicate texture; for a coarser, more dramatic look, use thicker compound and stipple more forcefully.